Disclosure: This post was sponsored by Sabra. All opinions and photos remain my own. Thank you for supporting the brands that help make this blog possible. Get ready to party on Thursday! Sabra is celebrating National Hummus Day this Thursday and you want to be a part of the action! For 24 hours on May 15, 2014, they will be giving out coupons on their Facebook page. You’ll also be able to download their ebook, Hummus for Dummies, starting Thursday. But that’s not all! Sabra will be giving away 10 $100 Visa Gift Cards and Party Prize Packs! All you have to do is load a picture of yourself with your beloved Sabra on Instagram or Twitter and tag it with #HummusDay for your chance to win! Sabra will contact 10 winners on 5/16/2014 via the platform they entered, so keep your eyes open. I’ll be cheering for you! Now that you know all the ways you can win by celebrating National Hummus Day, let me tell you how you can win in your own kitchen. 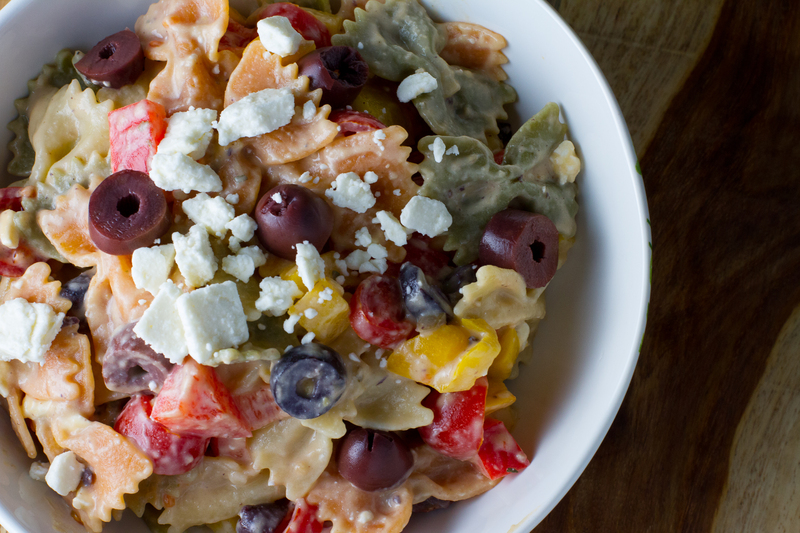 With this amazing pasta salad utilizing Sabra’s Olive Tapenade Hummus as the awesome sauce, you’ll turn a ho-hum, hum-drum, nothing special pasta salad into a beautiful thing. You’ll want to bring this to all your summer celebrations. Or hoard it in your fridge, saving it all for yourself. Whichever. I won’t judge. I LOVE the new Olive Tapenade Hummus. It’s a combination of black and green olives in the hummus you already love, offering a Mediterranean flair to any dish. What fabulous flavor! It’s quick, it’s easy, and you can take it with you just about anywhere. I keep some in the fridge at work, just in case I have a snack attack. And pita chips, of course–gotta have something to dip in it. 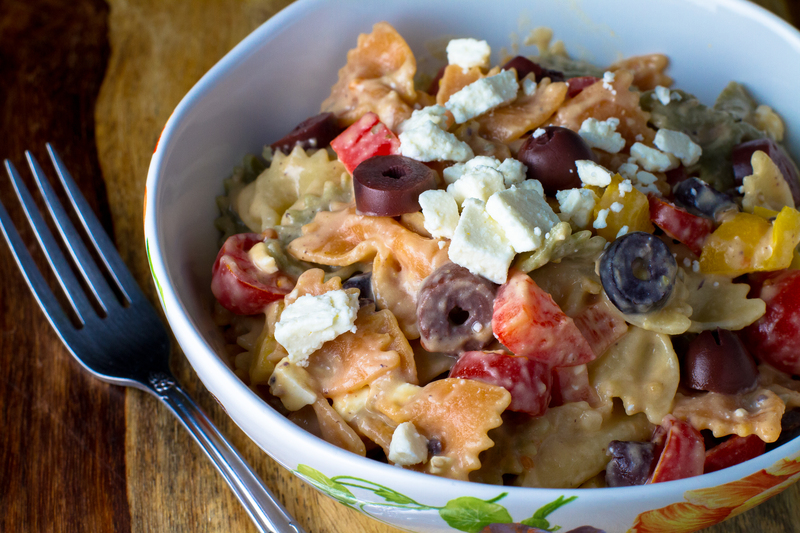 By adding the Olive Tapenade Hummus to pasta, you’ll have a whole new way to enjoy your favorite snack as a meal. Don’t like the peppers? Use cucumbers. Hate feta? Leave it out or add another kind of cheese instead. With a great base like this, there are infinite possibilities for a world of deliciousness! It’s all up to you!!! Cook pasta according to directions on the box to al dente, reserving ⅓ cup pasta water for later use. Drain pasta and rinse with cold water. Transfer to a large mixing bowl (I used the 6-quart bowl from my mixer). Add the tomatoes, peppers, and olives. In a medium mixing bowl, stir the reserved pasta water into the Olive Tapenade Hummus until smooth. Stir the hummus sauce into the pasta until coated well. Mix in the feta last, right before serving (or sprinkle crumbles over the top of each bowl served). Keep in an air-tight container in the refrigerator for up to 3 days. It’s very important that you reserve pasta water to thin out the hummus. It will be too gloppy if you try to add it without thinning. I’d like a truck full of this parked at my house, please! I’ll get on that right away!